Beautifully updated Colonial with gleaming hardwoods, 2 fireplaces, gas, great backyard, on a cul-de-sac and minutes to highways and the T. There's lots to love here; a spacious open plan kitchen and dining room, a welcoming 3 season room overlooking the backyard, a comfortable fireplaced family room and a more formal living room at the other end of the home - also with a fireplace Upstairs the master suite is a calming refuge, and the 3 other bedrooms share a nicely updated bath. The lower level is finished with a mud room at the garage entrance, and a media room adjacent. Behind the scenes is all good news, with a new furnace, hot water heater, stove and microwave, newer windows, new AC and so much more. The backyard is private, quiet, fenced and surrounded by wooded open space. 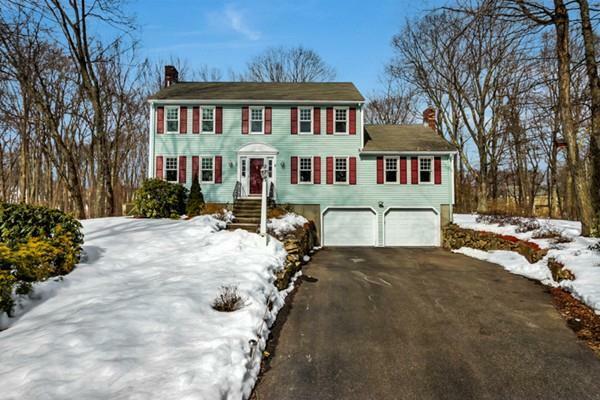 Peaceful - yet minutes to the Mass Pike and 3 different commuter rail stations. Add in a highly ranked school system, close to State Parks, trails and shopping - this home has it all! Don't miss it!